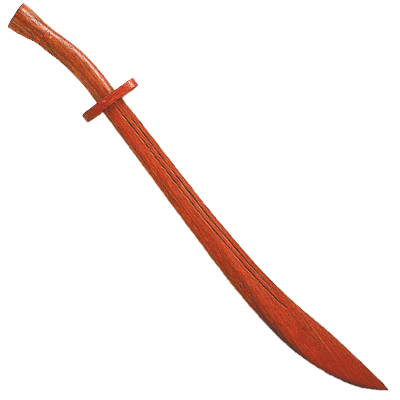 The saber (dao) is for defense an most often used for blocking. The dull, back edge of the blade blocks, followed by stabbing or cutting with the sharp edges. The saber is considered the prince of short armaments, and is traditionally learned before moving onto sword (jian) training. This wood saber is great for practicing your forms before progressing to a metal saber. This is safe way to develop good habits for yourself and partner. We have carefully selected this wood dao because it is well built, has good balance, and is affordably priced. This wood dao is ideal for either tai chi or kung fu training. We rate this wood saber as a good choice for every day training. Get one today and enjoy years of use. When you show your saber to someone who knows nothing about it, be sure to tell the person what to do before handing it to them. This will protect your saber and will prevent injury. Never lay your saber on the ground. Somebody may step on it (bad). Avoid unnecessary whacking with your wood saber. Too much whacking and it just might break. Once in a while, clean it, and apply a light coat of wood polish or wood oil to the blade. Stick with wood sabers until you are ready for a metal saber. Metal sabers hurt if you hit somebody in training. Be smart.